Between the M.C.M. 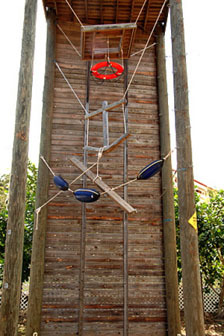 Center and the middle school campus is an adventure course named for Eddie O'Brien, a good friend of Antilles School. Designed to teach both trust in others and oneself, and self-esteem, the course offers many low element and rope activities that can be tailored to children & adults, and are effective in building teamwork in a school organization, or a corporate setting. Please contact Amy Gurlea at 340-776-1600 x2600 or agurlea@antilles.vi for more information.